The Staybridge Suites San Antonio SeaWorld is the perfect hotel to meet all the needs of the Extended-stay traveler. We are conveniently located across from SeaWorld San Antonio Texas Theme Park and only a few miles from Lackland Air Force Base & Port San Antonio. We are just minutes away from several Fortune 500 Companies such as Nationwide, Aetna, JP Morgan Chase & Wells Fargo. There is much to do here in San Antonio visit Six Flags Fiesta Texas, enjoy a barge ride on The Riverwalk, Remember The Alamo or see amazing views of the city from the top of Tower of the Americas. Our suites have fully equipped kitchens with room to spread out, space to work & relax. Enjoy amenities such as the complimentary laundry facilities, Wi-Fi access and our Fitness Center to help you stay active. For a late night snack you can always grab a treat in the Pantry, open 24 hours. Traveling with the entire family & your four legged friend Staybridge Suites San Antonio Seaworld is Pet Friendly, please check our pet policy for additional details. Enjoy our fabulous buffet breakfast served daily, there is something for everyone but dont miss out on our Texas shape waffles! Join us in the Great Room Monday, Tuesday and Wednesday evenings for our Social which features complimentary food and drinks. 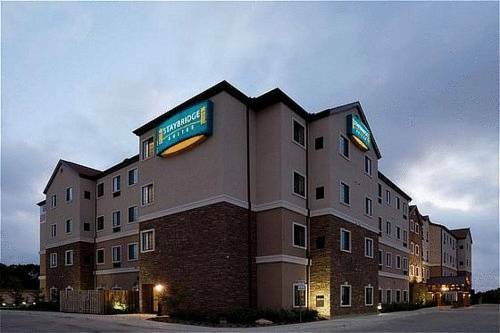 When you come to San Antonio, Texas we offer you the amenities & service that you need, Staybridge Suites San Antonio SeaWorld Area hotel is your best stay for a week, a month or a year! Staybridge Suites San Antonio Seaworld is located within walking distance to the world famous Rudy's BBQ. The have a variety of texas style BBQ. Board room table that seats 12. LCD over head projector, drop down screen and whiteboard included in meeting room rental. La Cantera Mall is the premire shopping experience in San Antonio. Staybridge Suites Seaworld is a short drive from the Shops at La Cantera. You can stroll in the beautiful couryard style shopping center and also enjoy one of the many restaurants. Enjoy the plentiful luxuries of Downtown San Antonio at the Riverwalk. Relax on a river boat tour or indulge yourself at one of the many restaurants with different tastes that the Riverwalk has to offer. Lackland Air Force Base is one of the main facilities used to train the very best United States Air Force Soldiers. Basic Training is one of the many uses for this Air Force Base where graduates proudly serve in the United States Armed Forces.